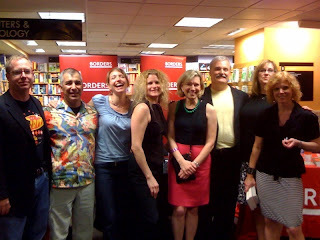 A review of my almost-week in the Big City wouldn’t be complete without a mention of a the Quick Thrills From Out-of-Towners reading I did at Borders Manhattan Park Avenue with several of my friends. Definitely one of my favorite parts of the week (running a hard third behind coffee with WDWF and sitting next to the devastatingly handsome Barry Eisler at two dinners! ), the event was conceived and organized by the beautiful and truly talented Michelle Gagnon whose latest novel, BONEYARD, is making quite the splash. Here’s a shot of the participants taken with Tim Maleeny’s camera–perhaps taken by our ticket chick and sultry snake model, Jennifer Talty. Lee Child introduced us, and several in the crowd of around fifty people were disappointed that Lee didn’t read. But in his typical spirit of generosity, he was careful to direct the spotlight on the rest of us, who are all on the emerging side of the business. It was a terrific crowd and I know I was grateful to see everyone there. A thousand thank-yous to Scott Marcus, the Borders Manhattan Park Avenue Manager! From left to right: Tim Maleeny, Mario Acevedo, Michelle Gagnon, Alexandra Sokoloff, me, Shane Gericke, J.T. Ellison, and Laura Caldwell. A special surprise for me was the appearance of my first and favorite stalker, Joe Frick, whom I met on myspace! He’s a grad student studying something about English as a second language and he’s lived in exotic locales like Thailand and Chicago and tells darned fine stories about his travels, domestic and foreign. He took a pic of us together–yes, photographic evidence of his obsession. I felt free to rip it from his awesome blog! I came over from Michelle’s blog. Good stuff here. I’ll go check out your webpage. WAS a grad student. I’m a real person now!!! I must say that being a ticket chick and a snake model was certainly the high light of my week in NYC! Of course, what a wonderful line up of authors. The readings were wonderful. Thrilling. Chilling. And of course, their was the snake. Well, two of them. Sigh… I had to give them up to the winners of the raffle. I miss the snakes. We couldn’t have asked for a better snake model- now I feel badly, though, we should have saved a snake for Jennifer to keep. We definitely have to do it again next year.